This reflection, offered by the Rev. 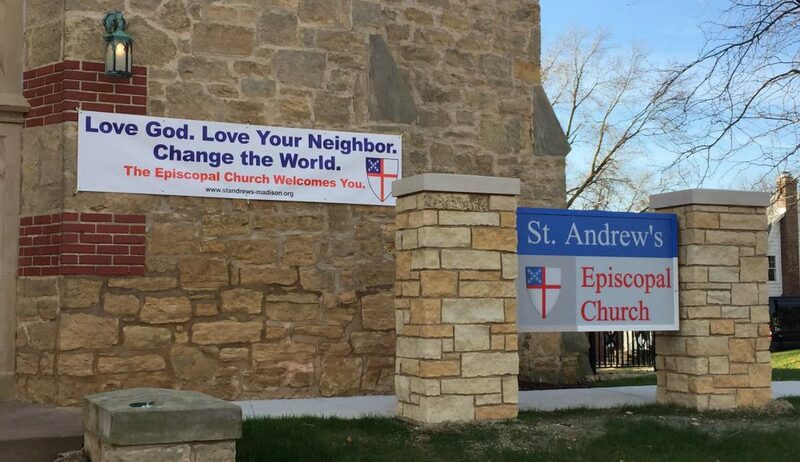 Andy Jones at St Andrew’s Episcopal Church in Madison, Wisconsin, on April 14, 2019, is built around the Gospel reading for the Liturgy of the Palms and the Passion Narrative assigned for Year C in the Revised Common Lectionary. The reflection was offered just prior to the reading of the Passion. This is a strange and difficult day. It wasn’t that long ago that Jesus raised Lazarus from the dead and the crowds started turning to him in huge numbers. So many people were believing in, and following him, that the authorities put a price on his head and he had to move north to avoid being arrested. But now he is back. He’s come south, from Ephraim to Bethany, to the home of Mary, Martha, and Lazarus, and today he’s riding over the Mount of Olives into Jerusalem! A triumphant entry into the city where God resides among God’s people. A parade, with singing and shouting, a moment of joy and celebration! But in just a few moments it will all take a dark turn. Betrayed by one of his own, Jesus will stand before Pilate and the elders of the people on trial; and in that moment of decision, as the whole world holds its breath to listen… we will join our voices with the crowd and call for his crucifixion, sending him to the cross. It is a terrible thing to see these moments juxtaposed, one right after the other. And if we are paying attention to what is happening, if we are present in this moment, it will shake us to our core, raising some very difficult and profound questions. But then that is what this day, this liturgy, is meant, is designed to do; to shake us to our core, and to raise the very difficult and profound questions with which we will wrestle for the remainder of our Lenten journey. In what ways have we chosen the politically expedient, the path of least resistance, the safety of quiet complacency or denial, and allowed Jesus, the Good News of God in Christ, Love come down, to be cursed, spat upon, and beaten, because the cost of standing by his side was too high? In what ways have we turned our backs, pretending not to see, as Jesus and all that he stands for is, in the name of security, preservation of the status quo, profit, and Empire… nailed to a tree just outside of town? Week after week we proclaim him and renew our commitment to follow where he leads. But today, today we hang him on a tree. If we are paying attention to what is happening, if we are truly present in this moment, it will shake us to our core, raising some very difficult and profound questions; questions with which we will wrestle for the remainder of our Lenten Journey, and perhaps, beyond. These are the questions which this day, this liturgy, is designed, is meant, to make us ask. At the conclusion of the Passion reading this morning, we will not recite the creed, proclaiming our faith, because at that moment we may not be sure what we believe. We will not pray for the whole state of Christ’s Church and the world, because, as Jesus hangs on a tree, we may not be sure that we have standing to plead before God on our own behalf or on behalf of others. We will not confess sour sins and hear the words of absolution, because awareness of those sins may be too fresh, to immediate, for us to effectively, and genuinely seek forgiveness. And to be absolved today, might let us off the hook for the rest of the week. At the conclusion of the Passion reading this morning, we will spend some time in silence, and then we will move to the Eucharist, the sacrament that Jesus institutes at the beginning of today’s reading of the passion. We will be fed. We will be offered some comfort and reassurance of God’s love. And then we will be sent out, to wrestle with our questions. Come back later this week. Bring your questions on Maundy Thursday and marvel that Jesus is washing your feet. Bring your questions on Good Friday in answer to the question – “Where you there? And then join us on Saturday night and on Sunday morning as we gather once again, to hear God’s answer to our questions.